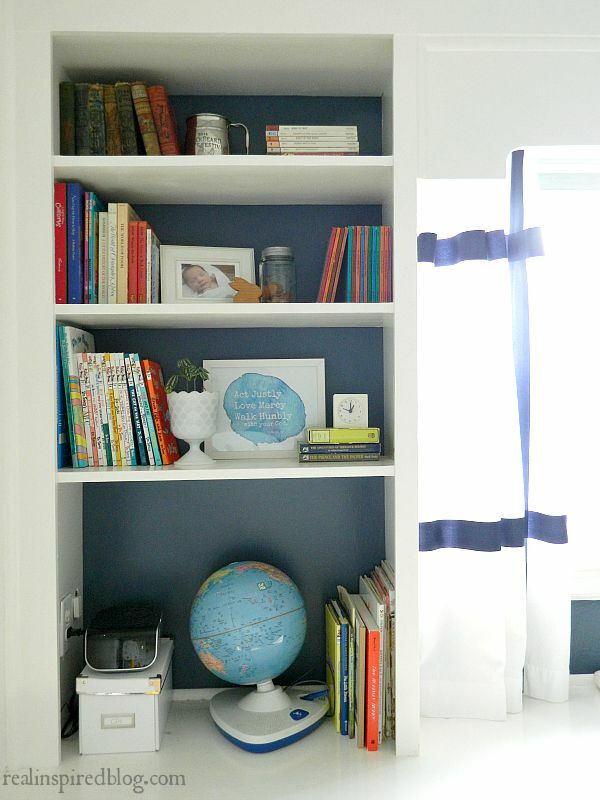 I put up my boys' vintage modern nursery reveal last fall and I just realized that I never told you all about the curtains! 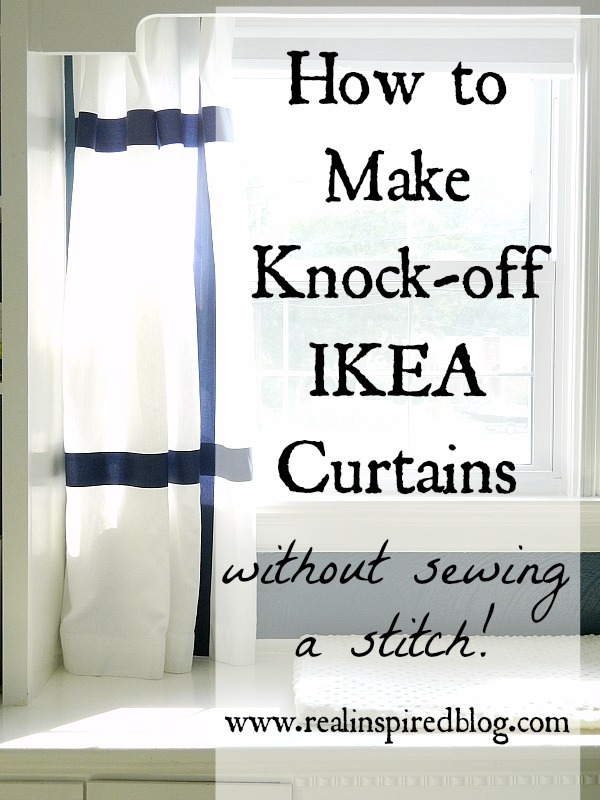 I hinted at a curtain tutorial and then never did it. Whoops! Well, here it is now and it's super easy! 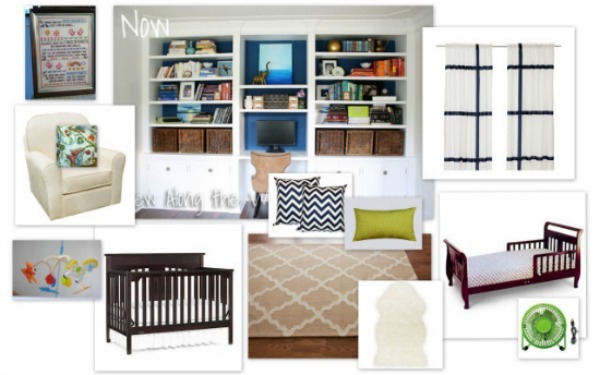 Once I knew the colors I wanted for the room, I put together this handy little mood board to help keep me on the right track. My inspiration curtains were the Marmorblad curtains from Ikea which have since been discontinued. They were simple and clean-lined but they added just the right amount of interest. 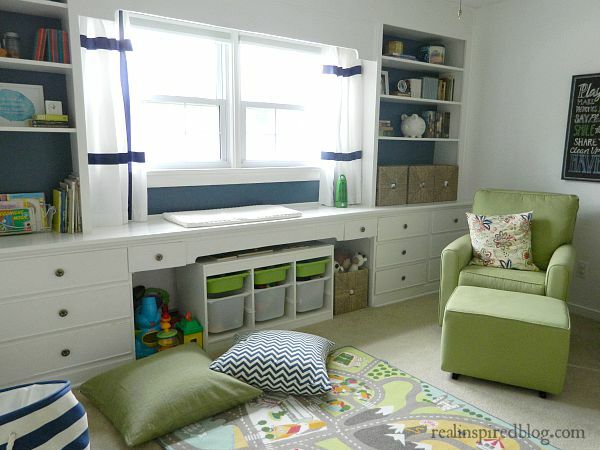 Only issue with them was the long length as I needed short curtains because of the built in desk that runs beneath the window in the nursery. I thought of just buying them and then hemming them to the shorter length, but I was afraid it would mess with the symmetry of the stripes. I ended up using a thrifted tab-top pair I already had that used to hang over the kitchen sink. The original plan was to get rid of the tab-top, mix up some blue paint with fabric medium, and sew blackout material to the back. After a while, my laziness super efficient problem solving skills took over and I decided to nix the blackout fabric, go with a blackout shade instead, and use iron-on sewing tape and blue ribbon for the stripes. Yes, I did right "no touch!" on my sewing scissors. Somebody kept using them for trivial things like opening the plastic wrapping on the cheese. You gotta do what you gotta do. First, iron the curtains well so it's easier to line everything up and make the tape stick. Next, I wanted to keep the tabs for hanging but I wanted to get rid of the actual tab-top part. I simply put fabric glue all over the back of the tab and then folded it over, pressing it down good against the back of the curtain. 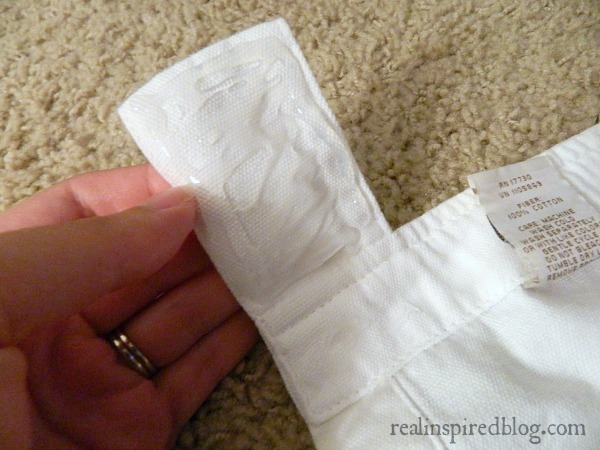 I chose to use permanant fabric glue because it is washable. Some fabric glues aren't and I wanted to make sure I could wash these curtains if I had to. You can see it better here. 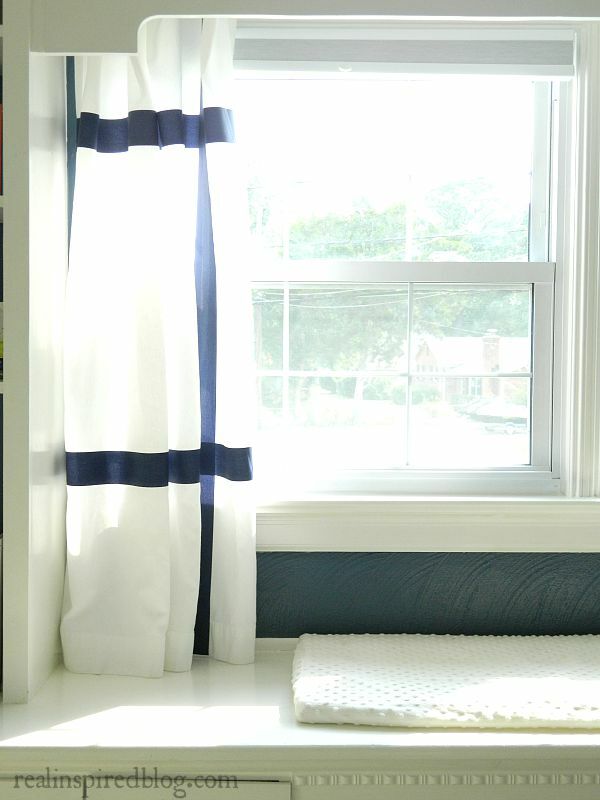 Instead of a tab-top curtain, it is now a "tab-back" curtain. I just slipped the curtain rod right through the tabs and it hangs normally. The next step is to mark where the stripes need to go and make sure the stripes are straight. I measured about 14" in from the top and bottom for the two horizontal stripes and about 8" in for the vertical stripe, periodically making little marks with the fabric pen the entire length and width as a guide. I measured and remeasured several times just to make sure everything was straight. 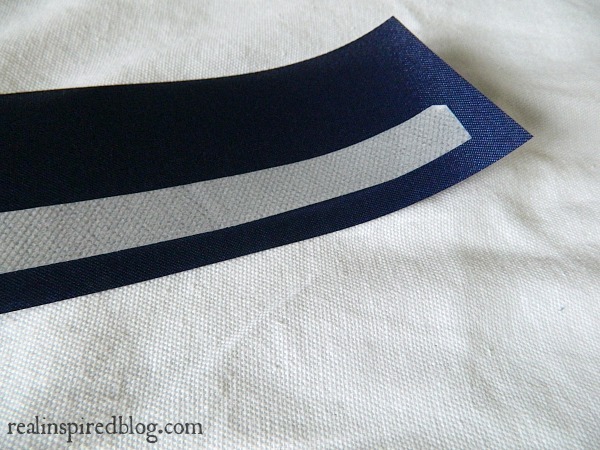 I used washable, iron-on permanent fabric tape to put on the ribbon stripes instead of sewing. I got the kind that is tacky on one side so it stays in place while ironing. Definitely go for that kind so the tape won't slide out of place. It makes everything so much easier. 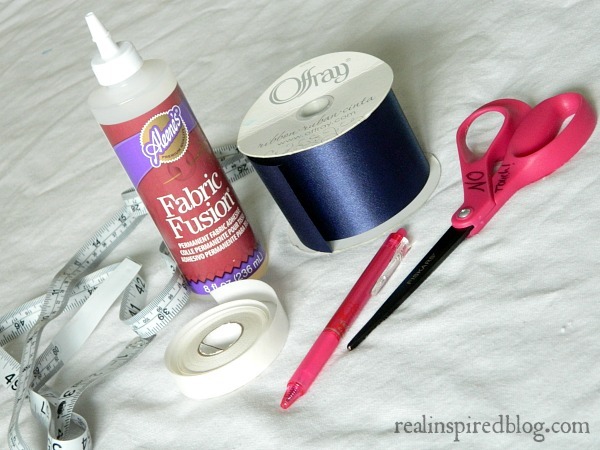 A note here: fabric glue may sound like an easier option to put on the ribbon stripes. Don't do it because it will show through the ribbon. Trust me, you do not want to have to rip half-dried gluey ribbon off your fabric and mess it up in the process. Which I totally did, except the new stripes went right where the old ones were so you can't tell. I mess up these things so you won't have to. Cut two strips of fabric tape for the entire length of each ribbon stripe. I chose wide satin ribbon for this project but, since I didn't want shiny stripes, I put the tape on the shiny side and made the matte underside of the ribbon the side that showed. 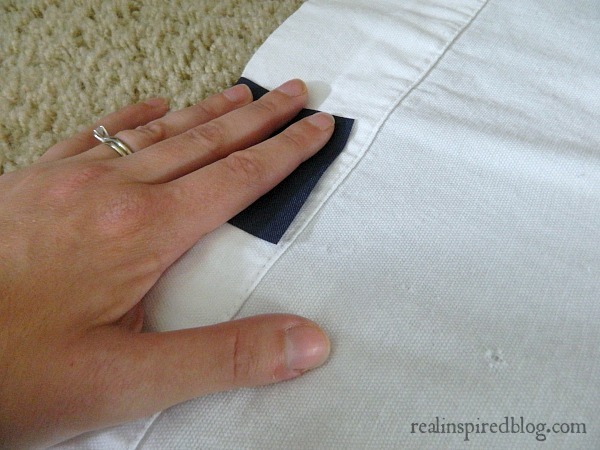 Line the stripes up using the fabric pen marks as a guide and leaving an overlap of 2-3" at each end. Do each stripe one at a time. Follow the directions for the right heat setting for the tape and go slowly, making sure the ribbon is pressed firmly and the heat has time to set the adhesive. I like to see how lazy I can be and get away with it so I didn't use a hard surface to do this panel and the tape didn't take well in some spots. 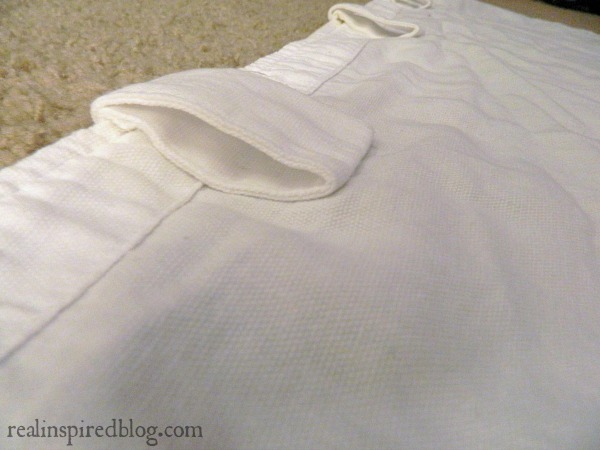 Flip the curtain around and fold the excess ribbon over on the back, ironing it so it stays flat. 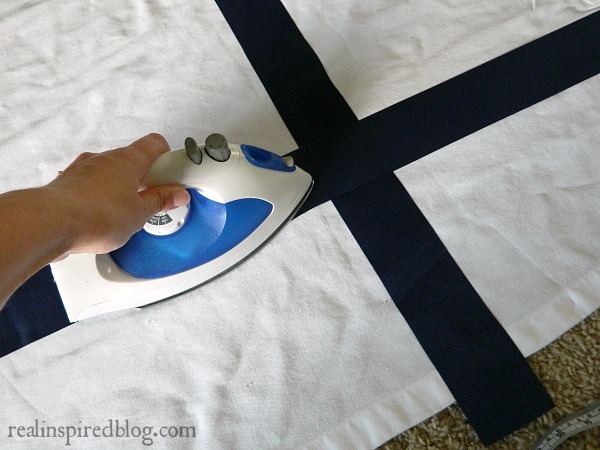 Add extra fabric tape to the end and iron it down. Tada! Isn't that the laziest way to make a curtain ever? These probably cost $15 at most with all the supplies since the curtains were bought at a thrift store. Aside from the time spent gluing stripes and taking them off, I had these done in one evening in less than two hours. Most of that time was just spent measuring and straightening. I loved how they turned out! You can't even tell it's ironed on ribbon unless you're standing right beside it. 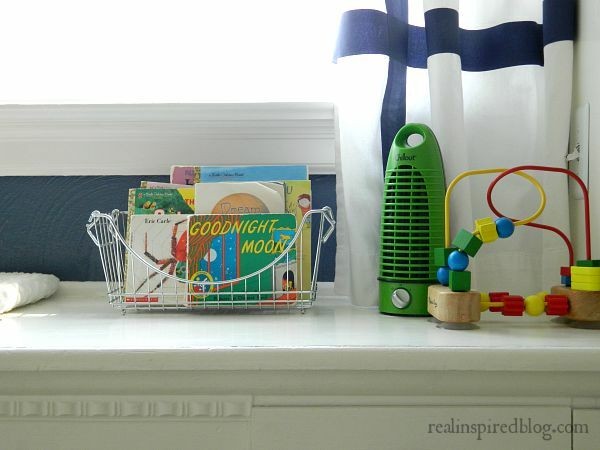 Lazy home decor for the win! WOOW! These are so beautiful! Do you remember how thick the ribbon was that you used? The biggest I see is 2 inches. Thank you so much! I did use two inch ribbon for these. I think I purchased it at Walmart.